​The first New Horizons Band was started in 1991 by Professor Roy Ernst at the Eastman School of Music, New York. His philosophy was that anyone can learn to play music at a level that will bring a sense of accomplishment and the ability to perform in a group. ​There are currently more than 200 New Horizons organizations in the United States, Canada, and Europe with many more bands, orchestras, and choruses in the planning stages. The UNI New Horizons Band began in 1999 with 17 members and has grown to its current size of 90+ members. This band welcomes anyone around age 50 and older who is interested in taking group lessons and/or playing in the band. Our band includes beginners, those who may have previously played an instrument, who currently play an instrument, or who might like to change instruments. The most senior members of our group are 90+ years old. ​Band members in the UNI New Horizons Band come from Grundy Center, Waverly, Janesville, Floyd, Readlyn, Sumner, Fredericksburg, Tripoli, Dysart, Hudson, Jesup, Denver, Charles City, Maynard, Oelwein, Dike, Waterloo and Cedar Falls. The UNI New Horizons Band is part of the UNI Community Music School. The Community Music School (CMS) offers innovative music education experiences for area youth and adults, provides mentored teaching opportunities for UNI School of Music students, and has established community-based partnership programs that promote and utilize the many resources and facets of cultural diversity at UNI and in the Cedar Valley. 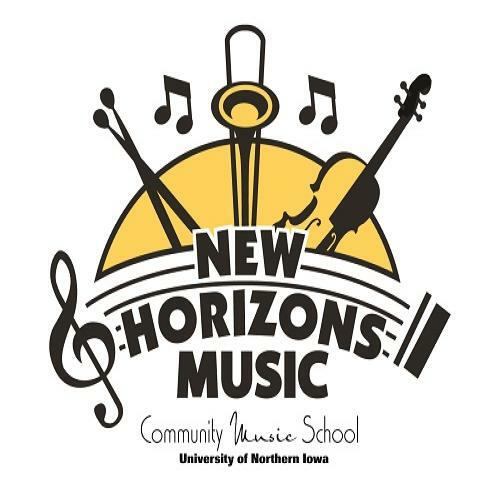 ​The UNI Community Music School offers private music instruction for piano, woodwinds, brass, and percussion instruments, group piano lessons, as well as the UNI Children’s Choir, Camp Musicmania, and the UNI New Horizons Band.